ETIHAD Rail, the developer and operator of the UAE’s national railway network, has awarded a major contract to National Transport & Contracting Company (NTCC) for the design and construction of employee residences in the Mirfa area of the UAE capital. NTCC, a building company operating in the Western Region of Abu Dhabi, said the housing complex will be built to the highest standards to accommodate employees of Etihad Rail DB – the operating partner for Stage One of the network. The construction work on the accommodation facility was expected to be completed in the second half of 2016. Etihad Rail DB signed a contract with NTCC to build 170 high-quality, serviced beachfront residential units equipped with advanced technology and entertainment systems. Faris Saif Al Mazrouei, the acting chief executive officer at Etihad Rail, said: “The presence of Etihad Rail’s operating arm in Mirfa has helped identify our first opportunity to begin fulfilling this vision, with the development of a permanent employee residences in the Western Region,” stated Al Mazrouei. “Etihad Rail is also currently collaborating with the Western Region Development Council (WRDC) to explore further long-term investment prospects, given WRDC’s numerous initiatives to develop residential real estate for the private sector,” he added. Etihad Rail DB employees and contractors have been working in the Western Region for more than one year now, facilitating an indirect investment in the region’s businesses and facilities. 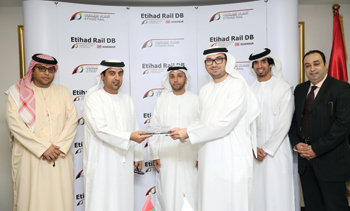 Shadi Malak, the acting chief executive of Etihad Rail DB, said its top priority was the safety and well-being of its employees. “We are committed to going beyond conventional methods to reinforce this, as the environment and nature of our work are unique. Our plan to build a dedicated residential building for our employees is a prime example of this commitment,” he said.